Amy Reynolds is Assistant Professor of Journalism at the University of Indiana. She is the author of the forthcoming Media Representations of September 11, and with Maxwell McCombs, The Poll with a Human Face (1999). Debra Reddin van Tuyll is Associate Professor, Department of Languages, Literature and Communications at Augusta State University, Augusta, GA. She is the co-author of The Civil War and the Press (2000). Van Tuyll, Debra. 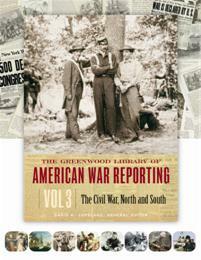 The Greenwood Library of American War Reporting: Volume 3, The Civil War, North and South. Greenwood, 2005. ABC-CLIO, publisher.abc-clio.com/9780313395383.